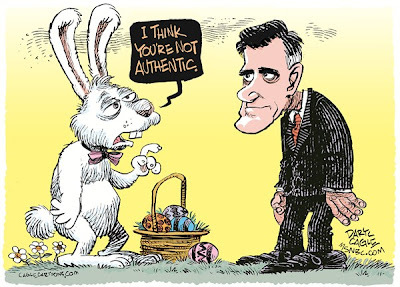 Now that all of the competition is out of the running, Willard “Mitt” Romney has become the heir apparent to the 2012 Republican presidential nomination. The Republican primary was one for the record-books, where a slew of colorful and interesting candidates crawled out of the woodwork to possibly capture the presidential nomination. There is a strong argument that Mitt Romney won the nomination, not by any charisma or skill of his own, but by a combination of an incredibly weak opposition, unlimited funds, and sheer persistence. Based upon the low turnouts at state primaries and the explosive rises of multiple “not-Romney” candidates, it appears that nobody actually likes Romney but, because he is not insane (unlike Bachmann), not imbecilic (unlike Perry), not obviously evil (unlike Newt Gingrich), not a serial-philanderer (unlike Cain) and not Ron Paul, he became the de-facto choice. It is a sad day in American politics where a major political party chooses their candidate due to their lack of being absolutely insane, ignorant, or immoral and not for their vision or personal triumphs. While I am a progressive, and would never vote for a right wing candidate, there are several characteristics of Romney that should disqualify him, even to conservative voters. Put plainly, even I can identify the fact that the Republican Party has better and more legitimate candidates than Romney; they just chose not to run them this election cycle. Out of all potential issues with Romney’s character (and there are many) I see five major problems with him, and would hope that the Republicans also identify these characteristics and vote for some other candidate Either Obama or a minor party). In New England there is a saying: “If you don’t like the weather, wait 10 minutes”. This cultural joke is based upon the rapid weather shifts (downpour to clear skies in minutes) sometimes experienced in the northeast. Unfortunately, Romney’s policy positions seem to be as flexible and changing as this saying would label New England weather – if you want a total change in Romney’s policy positions, just wait a few minutes. Probably the largest and most troubling issue with Mitt Romney’s character (and thus his presidential candidacy) is the fact that he seems to have few immutable positions. While some policy evolution is expected over a political career, Romney has taken this to the very extreme by having supported both sides of every important issue. It absolutely strains credulity to claim that Romney has shifted all of his political positions from one end of the spectrum to the other out of anything but opportunism. People’s views on policy are constantly adapting but, barring some severe head trauma, these views rarely shift from one end of the political spectrum to the polar opposite position. 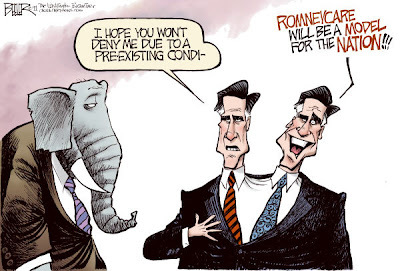 Romney has undergone a polar shift on virtually every issue of importance, demonstrating that he is either a pragmatic political opportunist (only supporting policy positions which he believes will get him elected), or schizophrenic (having two different personalities, each with their own ideologies). Either potential explanation as to Romney’s bipolar political ideology should disqualify him for consideration the minds of the voters. If you are still considering voting for Romney, ask yourself these two questions: What will you do if Romney shakes his policy “etch-a-sketch” and decides to erase his current ideology for his next incarnation? Can you take the chance that your candidate will invert his views upon getting into office (as he has a history of doing), or should you vote for somebody who has a consistent record of supporting your ideology? 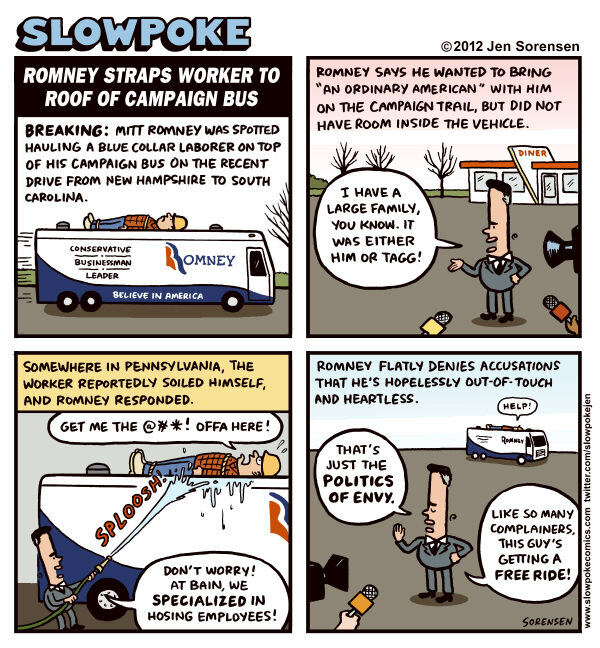 Put plainly, Romney is a political chameleon and holds nothing sacred enough to compromise his political standing for. In the current climate of war, terrorism, corruption and very powerful special interests, the United States needs somebody with guts and the willingness to put themselves on the line for the American people to hold the presidency. Romney, who has no core values (as described above) will never put himself on the line politically to stand on principle. Romney saw Grenell as the best man for the job, yet fired him because his personal life offends a small group of bigots, this raises large concerns over his ability to prioritize sound policy over the clamor of bigots. If Romney were to become president, he would represent the status quo (which is currently broken) and we would have little chance to progress as a country. Probably the most that the country could hope for from Romney would be his performance as a ventriloquist doll, with various special interests and political ideologues controlling his every move. Many would claim that Obama has shown the same timidity held by Romney on his personal conviction, but this is immaterial. If one candidate has a weakness, it does not excuse the same weakness in the other candidate – that path only forces a choice between two evils. There are Republican politicians who have very strong convictions (not ones I agree with, but there is no argument as to the depth of their conviction) and are far more deserving of the presidential nomination (Ex. Chris Christy and Ron Paul). 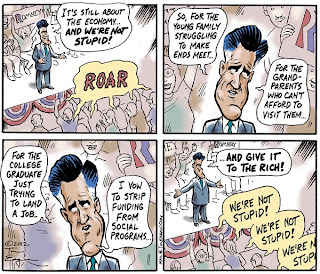 Mitt Romney has thrown his support behind the 2012 “Ryan Budget”, even referring to it as “marvelous”. While everybody is entitled to their own political opinions, Romney’s support for this budget signals his priorities in governing and should be used to determine whether or not he deserves support. The Ryan Budget would slash taxes for the wealthy, explode the national deficit, increase defense spending, and cripple most social assistance programs. By all objective assessments, this budget is simply a giveaway to the rich and an evisceration of programs aimed at the poor. If the Ryan Budget were to be signed into law, the federal government would be cut to the bone – destroying innumerable public sector jobs and reducing infrastructure investment – and the economic recovery would likely halt. When Romney was the governor of Massachusetts, he led the state to be 47th in job creation nationally. Even disregarding the fact that one of the states which he beat in job creation was Louisiana, which was hit by Hurricane Katrina, this job creation record is absolutely abysmal. The United States simply cannot afford to have such a president with such a terrible job creation record at the helm during a time of economic hardship. In the current political climate, corporate involvement in, and interference with, government has become a vital issue. Romney has consistently supported tax breaks and decreased regulations for corporations, as well as the mass privatization of public services. Ironically, these views are probably the only views which have remained consistent for Romney’s entire career (from being the head of Bain Capital, to the Republican candidacy), thus they are the only ones which the public can truly trust. If Romney were to be elected to the presidency, there is little doubt that corporate interests would be celebrating in their boardrooms. Romney’s support for corporations seems so reflexive that even a $3 billion loss during a single week incurred by JP Morgan has not shaken his support. In response to the staggering loss to JP Morgan, demonstrating the true danger of economic collapse which we still live under, Romney said that nothing should be done to prevent future losses, and that such losses are just part of business; the United States cannot afford a president with such a caviler and naïve outlook at corporate excesses. While the law recognizes corporations as people, as the law relates to free speech and political spending, it is rare for a politician to so clearly announce this in public. Romney appears to have spoken his actual belief, when he proclaimed that he sees corporations as people. Judging by this statement, it is unlikely that we would see campaign finance reform or a curbing of corporate interference in government during a Romney presidency – this is something that nobody, not Tea Partier, Occupier, conservative or liberal can support, or even tolerate. Romney has spent his entire life without showing a significant amount of human empathy, conscience or social responsibility. While these traits are not required to be the president, they ensure that a politician doesn’t take callous, immoral actions once in power or decide to ignore the plight of minorities of citizens. Looking at his work history, we see that Romney made an industry out of human misery. 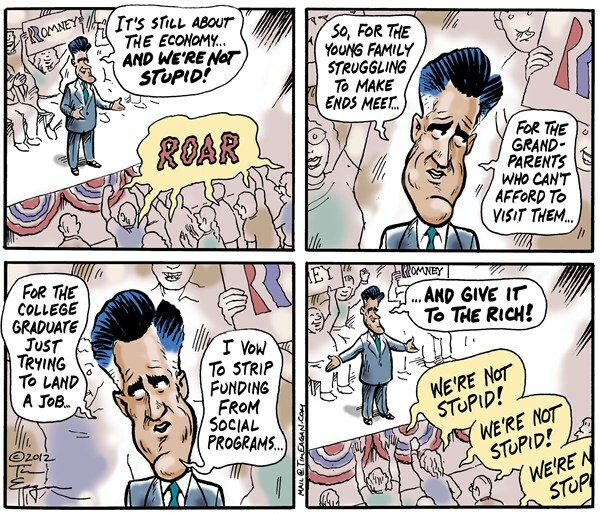 As a pioneer of vulture capitalism and the Founder of Bain Capital, Romney systematically bought, drained, and eventually killed companies; Romney’s work history is similar to that of a spider killing its prey: capturing weaker organisms, liquidating their insides, and sucking out the resources before leaving empty husks. As vulture capitalism is not illegal, merely parasitic and immoral, Romney hasn’t actually done anything wrong, but this should be taken into account when he asks to be given control of our country. In his personal life, Romney has shown indifference to suffering and a lack of social responsibility. Early in his life, Romney was a bigot and a bully. While this should not disqualify him from any position, it, in combination with other factors, points towards his predatory and callous nature. Romney’s tying his dog to the car for a long trip – simply hosing it off and continuing when the dog lost bowel controls due to fear – shows that even when the victim is a close personal contact, he still operates in clinical and callous manner. In both his personal and professional lives, Romney has never show an ounce of conscience or empathy. This borderline sociopathic personality leads to the important question: If you aren’t rich and entirely self-sufficient, can you risk giving Romney, who will feel nothing regardless of what his policy does to you or your family, the deciding vote over policy affecting your family?